Cover is compatible with short thrust buttons (.640''). Will not fit short water pumps(will fit Edelbrock short water pumps). Not for use with 350-7890 gear drive. These die-cast, polished aluminum timing covers come with oil pan seal, allen head bolts, washers, and gaskets. Allows quick camshaft removal without dropping the oil pan or breaking the seal. Lightweight .090'' aluminum for excellent strength. Includes all necessary gaskets, bolts and seals. These die-cast aluminum timing covers are stock replacement parts for late model EFI 5.0L and 351W engines. Includes gaskets and crankshaft seal. 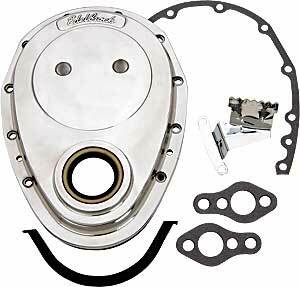 Both are compatible with stock or Edelbrock Victor Series aluminum water pumps. This die-cast aluminum timing cover for Pontiac comes with pan seal, gaskets and timing marker. Designed to fit 1969-79 350-455 c.i.d. Pontiac engines. Compatible with stock or Edelbrock Victor Series aluminum water pump, p/n 350-8856. Does Edelbrock 4240 fit your vehicle? 4240 is rated 5.0 out of 5 by 3. Rated 5 out of 5 by Jk55 from Great look and fit. This was a great addition to my engine dress up. Looks great ! WILL THIS COVER WORK WITH PRW GEAR DRIVE PART # 228-0135002 ? Yes, this should work with the gear drive.